Researchers from six U.S. universities will collaborate in the CONIX Research Center headquartered at Carnegie Mellon. For the next five years, CONIX will create the architecture for networked computing that lies between edge devices and the cloud. The challenge is to build this substrate so that future applications that are crucial to IoT can be hosted with performance, security, robustness, and privacy guarantees. “The extent to which IoT will disrupt our future will depend on how well we build scalable and secure networks that connect us to a very large number of systems that can orchestrate our lives and communities. CONIX will develop novel architectures for large-scale, distributed computing systems that have immense implications for social interaction, smart buildings and infrastructure, and highly connected communities, commerce and defense,” said James H. Garrett Jr., dean of Carnegie Mellon College of Engineering. CONIX, an acronym for Computing on Network Infrastructure for Pervasive Perception, Cognition, and Action, is directed by Anthony Rowe, the Dr. William D. and Nancy W. Strecker Early Career (Associate) Professor in Electrical and Computer Engineering at CMU. The assistant director, Prabal Dutta, is an associate professor at the University of California, Berkeley. Other CMU principle investigators include James Hoe, Vyas Sekar, Bryan Parno and Brandon Lucia of Electrical and Computer Engineering, and Chris Harrison of the Human-Computer Interaction Institute. IoT has pushed a major focus on edge devices. These devices make our homes and communities smarter through connectivity, and they are capable of sensing, learning and interacting with humans. In most current IoT systems, sensors send data to the cloud for processing and decision-making. However, massive amounts of sensor data coupled with technical constraints have created bottlenecks in the network that curtail efficiency and the development of new technologies, especially if timing is critical. The cloud’s centralized nature makes it easier to optimize and secure, however, there are tradeoffs. “Large systems that are centralized tend to struggle in terms of scale and have trouble reacting quickly outside of data centers,” Rowe explained. CONIX researchers will look at how machine-learning techniques that are often used in the context of cloud computing can be used to self-optimize networks to improve performance and even defend against cyberattacks. Developing a clean-slate distributed computing network will take an integrated view of sensing, processing, memory, dissemination and actuation. CONIX researchers intend to define the architecture for such networks now before attempts to work around current limitations create infrastructure that will be subject to rip-and-repair updates, resulting in reduced performance and security. Smart and connected communities — Researchers will explore the mechanisms for managing and processing millions of sensors’ feeds in urban environments. They will deploy CONIX edge devices across participating universities to monitor and visualize the flow of pedestrians. At scale, this lays the groundwork for all kinds of infrastructure management. Enhanced situational awareness at the edge — Efforts here will create on-demand information feeds for decision-makers by dispatching human-controlled swarming drones to provide aerial views of city streets. Imagine a system like Google Street View, only with live real-time data. This would have both civilian and military applications. For example, rescue teams in a disaster could use the system to zoom in on particular areas of interest at the click of a button. 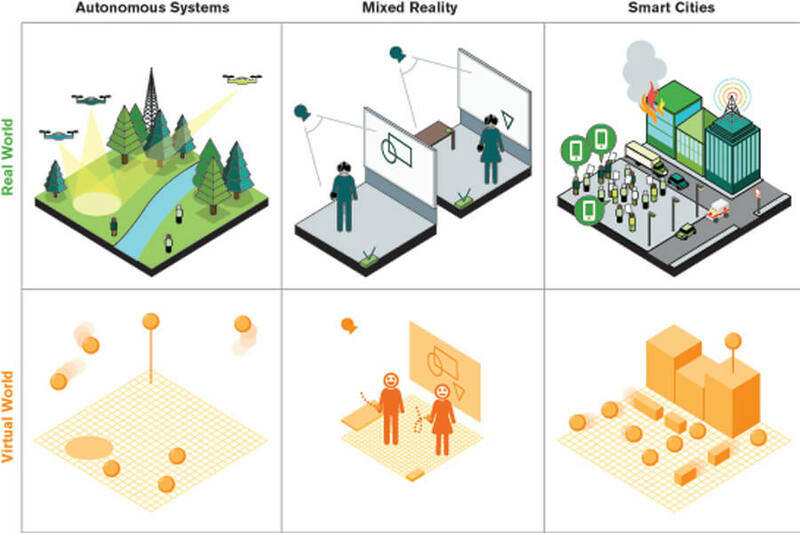 Interactive mixed reality — Physical and virtual reality systems will merge in a collaborative digital teleportation system. Researchers will capture physical aspects about users in a room, such as their bodies and facial expressions. Then, like a hologram, this information will be shared with people in different locations. The researchers will use this technology for meetings, uniting multiple CONIX teams. This same technology will be critical to support next-generation augmented reality systems being used in applications ranging from assisted surgery and virtual coaching to construction and manufacturing. In addition to Carnegie Mellon and the University of California, Berkeley, other participants include the University of California, Los Angeles, University of California, San Diego, University of Southern California, and University of Washington, Seattle. CONIX is one of six research centers funded by the SRC’s Joint University Microelectronics Program (JUMP), which represents a consortium of industrial participants and the Defense Advanced Research Projects Agency (DARPA).